is ALWAYS installed on the heated side of the wall or ceiling. This is to prevent moist air getting into the wall cavity where if will condense and may promote mold and mildew growth. Blanket fibreglass insulation on foundation wall in new home construction. A special tape is required to seal tears and joints in the vapour barrier. Having the work area well ventilated is also strongly recommended..
Fiberglass batt insulation is still the preferred choice for residential construction. It is not necessarily the best type of insulation around and it is virtually not used in commercial and industrial construction. Fiberglass batt insulation used to come with a paper vapour barrier attached to one side. It would fit between the joists and had a reinforced paper edge for stapling the batts in place. Today the standard fiberglass batts are slightly wider than the space between the wall studs or ceiling joists and are installed by friction-fit. Instead of each batt having its own vapour barrier, the barrier is now installed in wide sheets covering the insulation as well as the studs or ceiling joists. Batts are pre-cut to fit lumber spaced at 16" or 24" centers. Fiberglass insulation is also available in continuous rolls of up to 25 feet (7.6 m ) in length. Compressing the insulation reduces its effectiveness. Cutting it to accommodate electrical boxes and other obstructions allows air a free path to cross through the wall cavity. To prevent this from happening all outlet boxes have to be wrapped with a vapour barrier before installation. The airtight R-2000 outlet box is more effective, see vapour barriers. 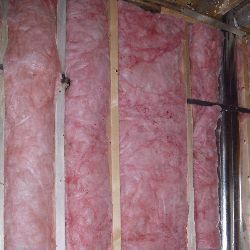 Also, gaps between batts can become sites of air infiltration or condensation (both of which reduce the effectiveness of the insulation) and requires strict attention during the installation. 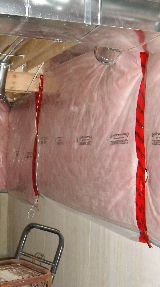 Fiberglass batts can be installed in two layers across an unfinished attic floor, perpendicular to each other, for increased effectiveness at preventing heat escaping. There are studies suggesting that fiberglass particles can be linked to respiratory problems and cause (temporarily) skin irritation. Some studies even suggest that there is a potential cancer risk from exposure to fiberglass particles. Therefore, when handling fiberglass insulation always wear long sleeved tops, gloves, eye protection and a face mask. Having the work area well ventilated is also recommended. Having the work area well ventilated is also strongly recommended.